The May Kits have been amazing to work with. Loved every bit. I used something from all of the kits for these projects, I love the color combinations you can make with them. Here’s what I have done. I had to use those amazing multi-colored Thickers as color on my layout. So I filled three-quarters of my page randomly placing them, and mixed in my title in between. The stencil, with a sponge tool, and the blue ink were perfect against that neutral pattern paper and with my theme! The next two projects are cards. One is bold and very tropical while the other still has a tropical feel, but is more soft and neutral. Absolutely love the possibilities with the stamps in this kit. Next, is a layout I took straight from one of my Instagram posts about my daughter. I used mostly yellow in this layout with pops of green, and just a little of the blue ink. Just love the possibilities with the stencils in the Color Kit. Gorgeous and inspiring kits! 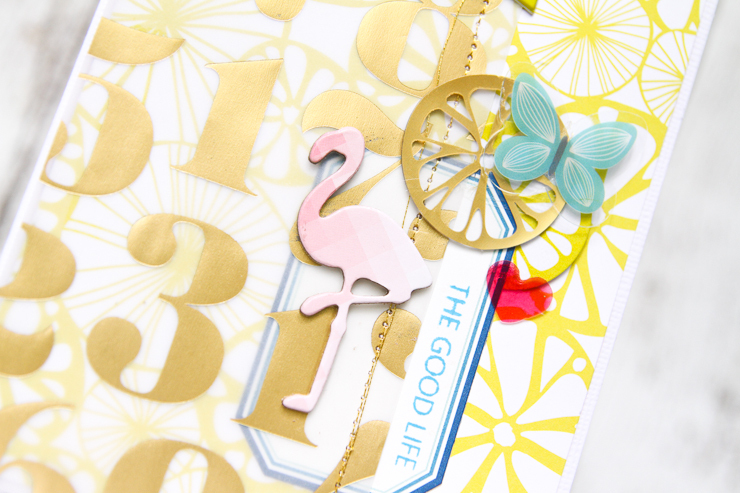 I have loved it here with Hip Kit Club…amazing kits, Kimberly is so awesome to work with, and so much inspiration from the team and the members. Thank you so much for having me here. Love these projects! Great ideas!